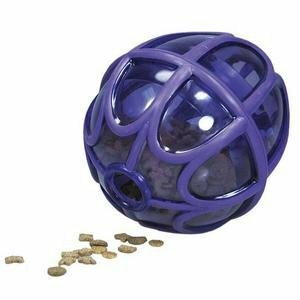 Kibble Nibble Dog Feeder Ball makes dogs work for their food. This activity ball mentally and physically stimulates dogs by appealing to their natural prey and stalking drives. Great for indoor dogs that need more exercise. Egg-shaped to make the rolling more unpredictable and stimulating for your pet. The customizable dual Treat Meters randomly dispense kibble and treats as the ball tumbles around. The Kibble Nibble also features rubber bumpers to minimize noise and marks on walls and floors. Pets should be supervised when playing with toys as no toy is completely indestructible. It holds a full meal and unscrews for easy loading and quick clean-up.